We had to make some changes to the theme. For some people most wanted change is the new Online status. But that’s not all, Version 1.1 brings you possibility to change spacing before and after logo to give you space for more creative backgrounds that will work with theme. Also we noticed that theme had some problems with third-side widgets so we made more complex styling. Fixed english language for comments. Simultaneously we release Online status WordPress plugin with similar functionality that is for free on Github. 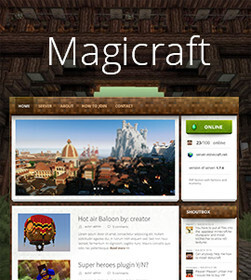 Let us know if you know about some impovement to theme or report some bug on magicraft@creepy.cz. We will gladly help.